Around the world, citizens of war torn countries in the Middle East (Syria, Iraq, Afghanistan), Africa (Libya, Sudan), Central & South America and others are fleeing oppression and death to reach freedom and safety. Europe is being overrun with these refugees. This experience is adding greater fuel to the already passionate immigration debate in the US by the needs of these refugees. We must remember that refugees are a portion of the immigration issue. Compassionately, the plight of refugees needs to be prioritized over all other types of immigration. Realistically, the vetting of legitimate refugees is still required, given the violent turmoil in the world, the infiltration of the extremists into the refugee population and that threats directly at the United States. The attorney general announced late last night that migrants who come to this country seeking asylum may wind up jailed indefinitely while they wait months or even years for their claims to be considered. Barr’s 11-page decision applies to migrants who have already established “a credible fear of persecution or torture” in their home country. 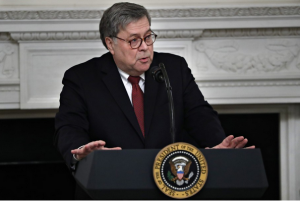 This is the first time that Barr has used his position as the nation’s chief law enforcement officer to overrule precedent-setting decisions made in immigration court. His ruling reverses a decision made in 2005 after an Indian man entered the United States from Mexico and sought asylum. The clear intent is to deter people from trying to seek asylum, no matter how credible their claims. A broken asylum system all but guarantees entry if you bring children. Immigration politics is so polarized that right and left have a veto over any constructive policy. Yet a genuine crisis is building at the southern border as the perverse incentives of U.S. asylum law invite a surge of migrants that is overwhelming border security. 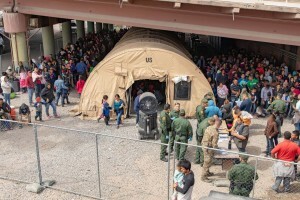 Customs and Border Protection Commissioner Kevin McAleenan said last week that the border has hit “a breaking point” amid a rush of families from Central America. More than a strong U.S. economy is driving this influx. Between 2000 and 2017, apprehensions dropped 80% as Mexico’s economy improved and border security tightened. But immigration has picked up over the last year as word has spread that parents with children who claim asylum can stay for years and perhaps forever. More than 76,000 immigrants illegally crossed the border in February and about half came with families, a 10-fold increase over the past two years. Border apprehensions in March probably exceeded 100,000, the highest monthly total in a decade. At the current rate, border apprehensions will exceed one million this year—the most since 2006—as human smugglers become more ambitious and reduce prices to entice more migrants.